ATLANTA and BENTONVILLE, Ark. — Sharecare, the digital health company helping people manage all their health in one place, and Walmart Inc. have announced a strategic partnership aimed at improving the health and wellbeing of the retail giant’s associates and their families and friends, as well as the people living in the communities in which their stores operate. This unique collaboration builds on Walmart’s associate wellness strategies and delivers on its commitment to improve the health of its communities. Over the past four years, thousands of Walmart associates have transformed their lives by participating in the ZP Challenge, a series of 21-day programs that encourages and rewards associates and their families to improve their overall wellbeing by making better choices every day in the categories of fitness, family, food, and money. Building on the success of this initiative, Walmart will offer its associates using ZP with access to Sharecare, providing them with even more robust health and wellness resources to help them live their healthiest, happiest, most productive lives. Walmart also will provide its associates and their families, alumni, and the community at large with full access to Sharecare to help each of them better understand, track, and improve their health, no matter where they are in their health journey. The Sharecare app will provide each person with timely and actionable steps to improve their health through innovative tools, health trackers and content, which will include news articles, tips, and programs inspired by and featuring Walmart associates who have positively impacted their lives with ZP. 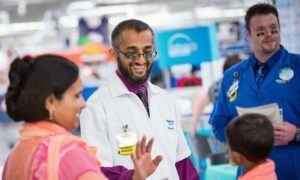 Additionally, later this year, Walmart will feature Sharecare in its Walmart Wellness Day quarterly in-store events, which offer a unique experience for busy families to learn how they can make positive changes in their health to save money and live better.